NATURE TRAVEL EGYPT | Your guides to Sinai, Egypt, and beyond. 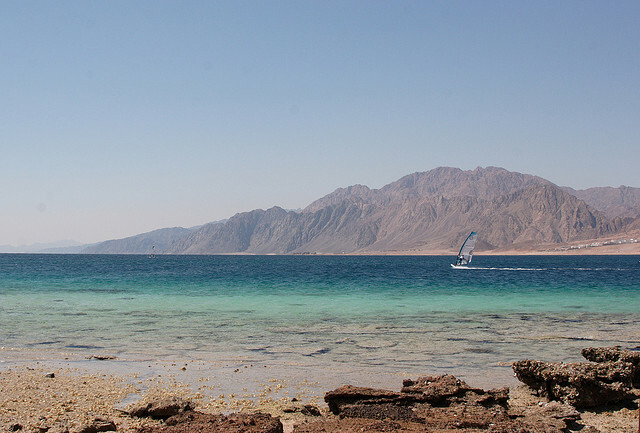 Dahab is located some 85 km (53 miles) north of Sharm el-Sheikh on the Gulf of Aqaba, near the southern tip of Sinai. Once an isolated coastal village, Dahab turned into a hippie hangout in the 1980′s and became something of an “alternative resort”, mixing cheap accommodation with a laid back lifestyle. Activities such as wind surfing, snorkeling, scuba diving and camel and jeep trips make it one of the most popular destinations along the Red Sea. Red C Villas and Apartments in Dahab https://naturetravelegypt.wordpress.com/2013/07/27/red-c-apartments-dahab/ does not have rooms decorated with the paintings on papyrus or fanciful images of pyramids and palms that you find in too many Egyptian hotels and accommodations. Instead they have high quality photographs by a local photographer, and Bedouin face veils, each one embellished by hand and unique. The collection of one of the owners has been framed and is now shared with guests, bringing a special piece of Sinai heritage into your stay here. Is it safe to travel now in Egypt? many people ask this as Egypt is in the news internationally because of demonstrations here. However these protests are in small areas, not the entire country. The media focus on them and do not tell the whole story. When there is a protest in one part of Cairo it does not affect the rest, where life goes on as normal. The media only say “Sinai” in news reports, but being in North Sinai and being in South Sinai is completely different. Imagine for example that you plan to go to San Francisco and something happens in New York, and everyone tells you “don’t travel to the USA, it is all dangerous!” You know these places are far apart and conditions in each city are different, so you travel to San Francisco anyway. This is how things are in Egypt. South Sinai, the coast route from Taba to Sharm el Sheikh and including the towns of Nuweiba, Dahab, and the town of Saint Catherine and its Monastery are all safe, people are enjoying their holidays here and going on pilgrimage as usual. Travelling with Nature Travel you will be looked after and secure. Nature Travel uses these roads and brings visitors from all over the world to these places every day. Please contact us if you have any questions on +20 693500391. If you are looking for somewhere special to stay and have never considered Dahab, this slideshow may make you think again. Dahab offers a laid back atmosphere, a spread of cafes and restaurants, great scuba diving and snorkeling, and a convenient base for trips into the Sinai desert and mountains. Dahab has a wide choice of accommodation from backpacker bargain places to 5 star. But if you are looking for something more intimate, set a little apart from the crowd but still close to all the attractions, beautifully designed and with the feel of a home away from home, Red C Villas and Apartments are a new addition that answers your dreams. If you are not familiar with Dahab but know Sharm el Sheikh or usually stay there, Dahab is only an hour by car from Sharm International Airport. Dahab has a very different atmosphere to Sharm, offering similar Red Sea water sport attractions (including famous dive spot, the Blue Hole), desert escapes, and nearby destinations such as St Catherine’s Monastery and Mt Moses. Traditionally a Bedouin fishing settlement, it is now a small, thriving community of native Bedouins, Egyptians and expats. The Red C complex has a sparkling central pool (actually multiple pools, including one for children, and a small waterfall), with each air-conditioned apartment positioned to give you privacy. Each has either balcony or garden area, views of the pool and mountains, and some have great views across the Red Sea. Kitchens have all you need for self-catering, and there is always the possibility of a bbq, or a special Bedouin dinner can be arranged. A washing machine is shared between all the apartments. Beaches and shops are a short walk away. The layout offers flexibility for family stays, or even for a group workshop or retreat. Meticulous attention to details has created rooms that have plenty of natural light, space, and superior finishes, furnishings and decoration, with local stone and wood featured. A distinctive addition is a collection of beautiful Bedouin burka or face veils, which have been framed and feature throughout the apartments. Bedouin burkas are ornate, decorated with gold and silver coins, beading and fine details. They are not often made like this by the Bedouin women now, and each one has some element of fascination in its design. Having one in your bedroom is like having your own art treasure, and a reminder of the traditional culture of Sinai. At Red C your holiday can include as much or as little activity as you decide. Owners Dom, Steve and Summer share their experiences as long term Dahab residents and can advise you on the best of everything locally, whatever your interests. They are divers, and full diving holidays for beginners through to those with more experience are available through their partner dive centre H20 Divers Dahab. There are free Scuba try dives in the Red C pool for all non diver guests during 2013. Private yoga classes, pilates classes and in-room massages are available and guests can choose where they would like to take a class or massage – pool side, roof terrace or the comfort of the apartment.